This doesn't come as a surprise to any of us. Royal Caribbean's newest ship, the Harmony of the Seas, currently holds the record for the world's largest cruise ship. She measures 1,188ft long and cost Royal Caribbean $1 billion to build. She can carry 6,780 guests and 2,100 crew members. Harmony's weight is 227,000 GRT and is 1,718 mor GRT that the previous record holder, Harmony's sister, the Allure of the Seas. The AIDAbella currently holds the world record for the largest ship to pull a water-skier. Back in 2010, a German reporter, Jan Schwiderk, water-skied for six minutes at 14 knots (16 MPH). The AIDAbella is 252m long, weighs 69,203 GRT and has a capacity of more than 2,000 passengers. Hurtigruten's NordNorge ship currently holds the record for the longest live TV documentary aboard a cruise ship. The documentary ran for 134 hours (just over 5 days), documenting the coastline of Norway. It is reported that three million Norwegians tuned into the 5 day broadcast. That's pretty remarkabkle considering that the population of Norway at the time was five million. Back in 2008, Carnival Cruise Lines broke the record for world's largest beach ball. In fact there was 2. The stunt was a part of a commercial (video above). The diameter of the balls measured 36ft (11m). They dropped the two beach balls off of a building in Dallas, Texas, into a crowd of more than 2,500 people. The record was broken when someone made a beach ball that measured 51ft and 10in (15.82m). Royal Caribbean's Quantum of the Seas features the "North Star", unique to Royal Caribbean's Quantum Class cruise ships. The North Star provides a 360 degree view from 300 feet above the ocean. These views include the Statue of Liberty, the Bahamas, New Zealand, Hong Kong, and the Sydney Opera House. This one million euro ($1,239,295) 4 month long cruise is offered by Six Star Cruises. It sails to 28 countries in 124 days. Luxuries include passengers being taken from their home to the airport by helicopter. The passengers are served Beluga caviar and Da Hong Pao tea, flown to the U.S. in a private jet, and driven by a chauffeur in a Rolls Royce Phantom to the cruise. It's definitely worth the money if you can afford it. 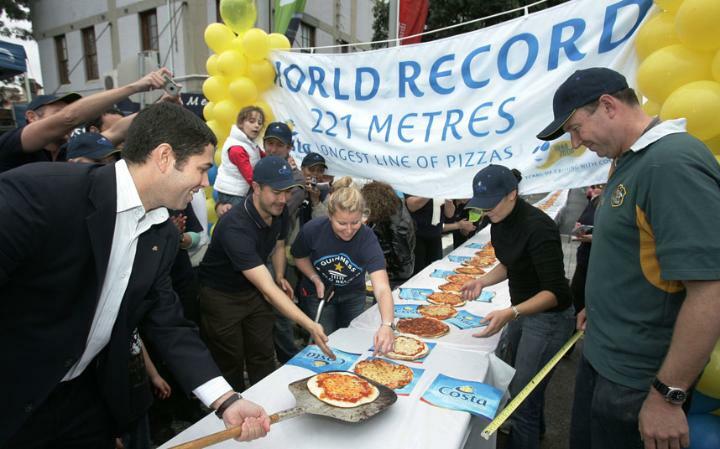 In 2008, Costa Cruise Lines sponsored an event where a team of 25 chefs attempted to make the longest line of pizza in the world. They compared the length to the 221m (725ft) Costa Classica. They broke the record, but have since been beaten by a 541.8m (1,777ft) line created in Florida, in 2009. 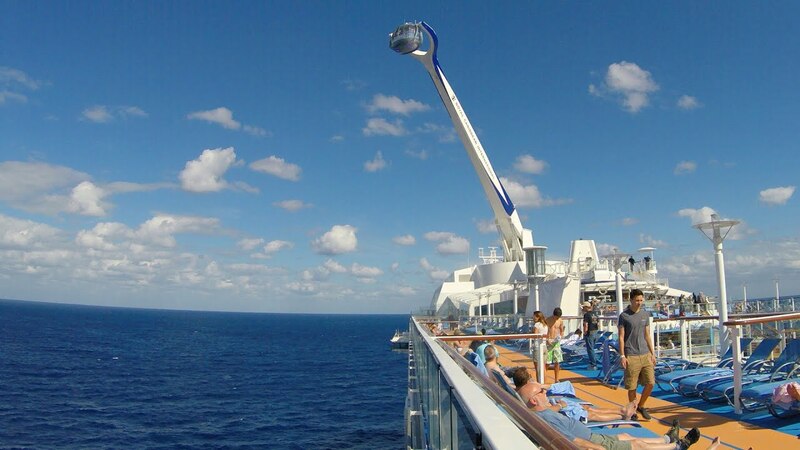 In 2010, Bello Nock completed a 130m (429ft) unsupported tightrope walk 20m (33ft) above sea level aboard Royal Caribbean's Majesty of the Seas. Majesty provided Nock with poles and spectators for the event. 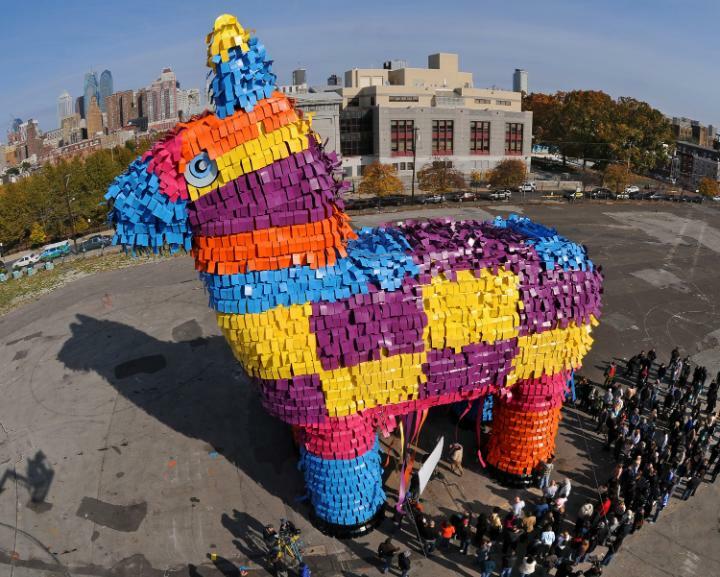 Carnival Cruise Line broke the record for the world's largest Piñata in 2008. This giant donkey was also used as an aid for a T.V. ad for the cruise line. It measured 60ft long, 61ft tall, and was filled with 3,630 pieces of candy. This record was then broken my M&M's in 2011.